Fellas, growing a beard is definitely in, so here are some tips and tricks on growing a thick and full beard. Keep in mind that the hair on your face is like any part of the hair on your body. While genetics play a role in growing a full beard, you can maximize your facial hair growth potential. However, you can make it work to your advantage if you promote facial hair growth and take steps to reaching your beard's highest potential! I am a huge fan of letting your beard grow out. Nothing like a well-groomed man. Am I right ladies? Okay, all seriousness I wanted to show some love to our black men and specialize this for black men beard care. I have asked many of my male friends to help me out on this one and did a little research of my own on what can make your beard grow. Over the few years many men have now been embracing their beards and natural hair too! Here I will be sharing a few pointers on growing a healthy beard courtesy of some of my male friends. >> SEE ALSO: Natural Hair Care Products For Black Hair: What’s in Your Spray Bottle? What are some ways to make your beard grow? Many of the things I found while doing my research were almost identical to natural hair care. There are also many products to try and get familiar with to help promote promote facial hair growth. Experiment with them and see what best works for you. Sticking with a routine is probably the key element in seeing the best best facial hair growth results. Try moisturizing your beard as soon as you get out the shower followed by a beard balm and beard oil. 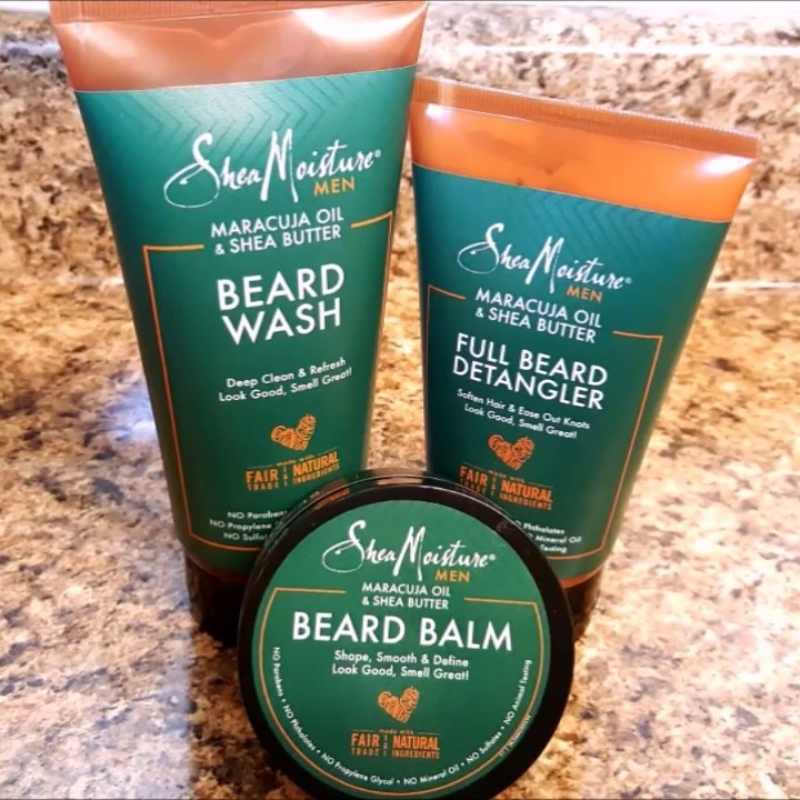 This will help seal in the moisture after you apply your facial hair products and keeping your beard happy! Shaping your beard and beard grooming is where you will get to really personalize the experience. Build a great relationship with your beard and barber. Below is a list of things to consider, while growing that healthy beard we ladies love to see! Genetics - Plays a role in growing a full beard and it's something you can not change but you can work within it. Diet - Just like everything else, a good diet is a key to optimal health and to promote beard growth. Beard Grooming - Washing your bead tools properly and often is essential to avoid bacteria growth and ingrown hair etc. Trimming your split ends is important just like the hair on your head. Trimming your beard will be apart of this process in growing a healthy beard. Patience & Time - You are going to have put this into action! Growing a beard is a journey and it will test you. Washing your beard 2X/week with beard shampoo - Beard shampoo is designed for the beard and includes ingredients that help with natural beard growth and healthy beard maintenance. Beard Oil with essential oils great for adding this into your routine. Good barber relationship - Having a good relationship with your barber can make things a lot easier in outlining your beard, and shaping it to the way you want it. Speak up and let them know exactly what you want! There are beard subscription, website, and care packages that you can sign up for with beard care products! Here are few websites to check out owned by black men. www.DrGoatBFC.com - Products contain no alcohol and price point is about $15-50$. Before you make that trip to the barber, let your beard grow for at least a month. Waiting to trim the neckline, upper cheeks, and mustache can help you see your beard growth patterns. If you go to the barber too soon, it can impact your natural beard growth. Let me know where you are in beard journey? If you have any additional beard growth tips to share comment below. Good luck on your journey kings! Natural Hair Growth: Do You Want Long Natural Hair? “Why can’t I grow long natural hair?” Growing long natural hair can be daunting especially if you don’t know where to begin! Here are some essential oils that will help your aid your natural hair growth! There is more to the journey than just hair! Check out this list of tips that every natural should know about natural hairstyles for black women!